Mary began her studies and work as an artist in 1977 at the Laguna Beach School of Art, but has spent most of her career in the San Francisco area, principally in Mill Valley. Mary says of her style, "the figures I draw embrace the action, so as to capture the essence of the moment; to create a spontaneous dialogue of motion and emotion. Each piece is a statement of my personal seduction by the subject, and my desire to enter into its’ magic, mystery and grace". 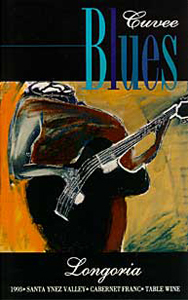 When I first spoke with Mary about the Blues Cuvée artist series, she immediately knew that she wanted to do a piece for it. With blues music vibrating the walls of her studio, Mary produced our first Blues Cuvée painting and it is stunning! She has captured the motion and emotion of the true blues singer and guitarist. I look at the image and I can almost hear Muddy Waters singing the blues!